We are excited to welcome ex Coastal Dance (1st generation) student Beau Middlebrook back to the studio to teach a workshop on Thursday the 11th of December. There will be 2 levels – Junior (13 years & under) is 4:00 – 5:30 & Senior (14 Years & Over) 5:30 – 7:00. 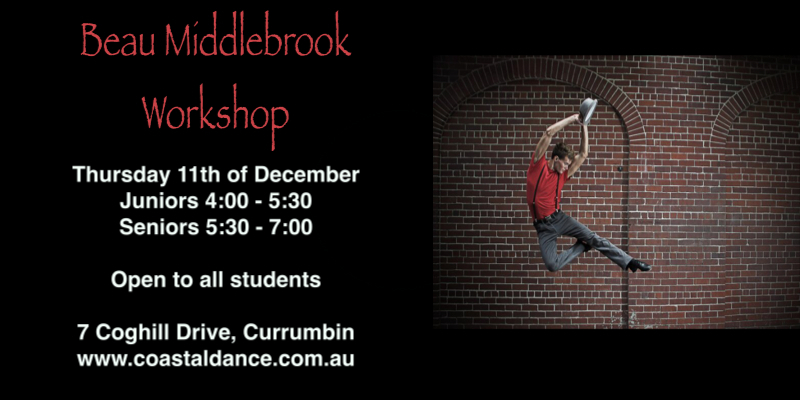 This workshop is free for Coastal Dance students & $10 for outsiders. Beau has just returned from the international tour of West Side Story, has previously worked for Disney cruise lines & studied at Broadway Dance Center. We are excited to welcome Beau back to Coastal Dance!